BRIDGEWATER, Mass. - Ever since falling to their Hockomock League rival in Franklin by 14 at home, Mansfield has looked like a completely different team. In large part, that can be attributed to the play of Tyler Boulter and Christian Weber, who both were implored in the last two weeks by head coach Mike Vaughan to become more aggressive at the offensive end. Both Boulter and Weber have responded to Vaughan’s words with authority, and continued their high level of play on Sunday night. Behind 17 points from Weber and 13 more from Boulter, the Hornets knocked off Bridgewater-Raynham 52-45 at Bridgewater-Raynham High School. Boulter’s performance comes just five days after he set a school record for three-pointers with 10 this past Tuesday. The Trojans (10-3), for their part, played a hard-nosed, physical style of defense that few teams can. Throughout the game, Bridgewater-Raynham consistently forced Mansfield (12-2) to work from around the perimeter, deflecting multiple entry passes and limiting the Hornets second chance opportunities. Offensively, however, the Trojans struggled. They shot just 37 percent from the field and a mere 28 percent from three-point land. It seemed that every time a basket was needed at a pivotal moment during the course of the contest, Mansfield was the one to offer it. Vaughan noted how the emergence of Boulter and Weber as legitimate scoring threats adds a whole new dimension to the Hornets’ offense. Bridgewater-Raynham and Mansfield exchanged leads throughout the first quarter, with E.J, Dambreville scoring six first quarter points to put the Trojans up 11-10 after one. Early in the second quarter, however, Boulter found his rhythm. Seven straight points from the junior sharpshooter gave Mansfield a one-point edge, 22-21. After a Doug Alves three pointer put Bridgewater-Raynham back ahead, Boulter rose to the occasion yet again, dishing a pretty pass off to Goldberg for a lay up and drilling a three pointer as the half expired to hand Mansfield a 29-25 lead at the break. The third quarter belonged to Weber. The senior point guard scored eight points to open the frame around a Goldberg basket as part of a 10-2 run to give Mansfield a 37-27 advantage. Bridgewater-Raynham was able to claw back within six on an offensive put back by Bobby Long, and a floater by Dambreville. Towards the end of the quarter, however, the Trojans lost composure, turning it over on three consecutive possessions. Those turnovers quickly translated into six points – the last two of which came on a layup by Max Boen as the third quarter buzzer sounded, putting Mansfield on top 45-33. Mansfield’s disciplined offensive attack refused to allow the Trojans to get on any sort of consistent run in the fourth quarter. When John Tesson opened the final frame by trimming the Trojans’ deficit to nine on a shot from beyond the arc, the Hornets responded with consecutive back door layups from Goldberg. 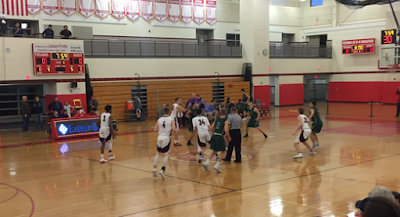 With under two minutes to play the Trojans attempted to come up with one last spurt as Dambreville knocked down two from the charity stripe and hit a fall away in the lane to bring Bridgewater-Raynham within 49-43. Goldberg, however, hit two free throws of his own to push the Mansfield lead back up to eight and seal the victory. Now, with its eyes turned toward securing two home games in the state tournament, Mansfield finds itself with two more difficult road tests this week. The Hornets will take on Milford Tuesday, before heading to Taunton on Friday.